You may have heard of wheel tracking, or wheel alignment - but knowing what it actually means can help you understand how to prevent poor alignment on your own vehicle. Learn what wheel alignment is, what causes it to change, and if your car is already in need of wheel alignment today. Wheel alignment, or wheel tracking, refers to the angle and the direction that your tyres are set to. This will be determined by the manufacturer specifications to ensure that the vehicle's wheels are set to the optimum position for the car's performance. 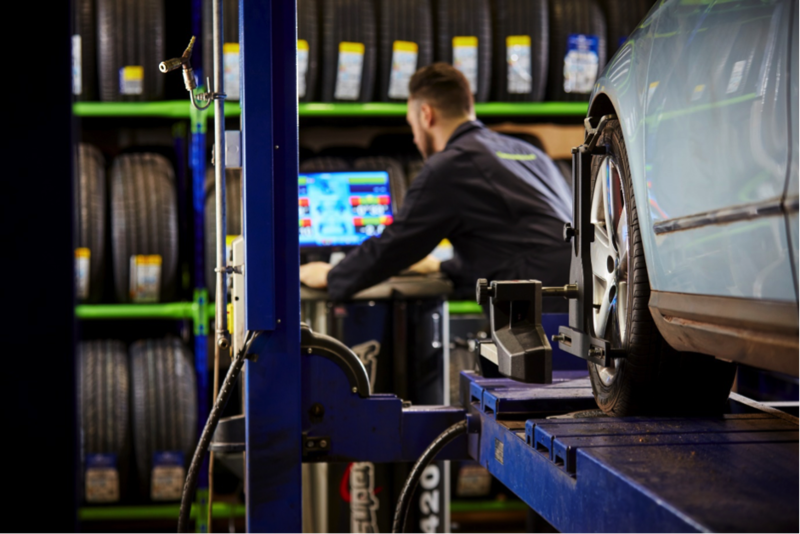 When wheel alignment is incorrect or out of place, this can cause problems for the car including tyres becoming worn down irregularly, issues with braking distance, increased fuel consumption and potentially compromising the general safety of the vehicle. So now we're clued up on the importance of wheel alignment, it may be worth ensuring your own car is aligned correctly. Checking the wheel alignment on your vehicle regularly is a great way to prolong the life of your tyres, as well as improving fuel efficiency. Drag or pulling to one side - if the alignment is slightly off, it could indicate the wheels on each side aren't equal. When this happens, the car naturally pulls to the one side - meaning you will need to steer the wheel the other way to compensate that. Wear on tyres - look for premature wear on the inside or outside shoulder of the tyre, which could indicate that the wheel alignment may have changed. Steering wheel vibration - in some vehicles, you may notice when driving that the steering wheel can vibrate. However, if this appears excessive, or unusual, it may be because your wheel alignment is out. What causes bad wheel alignment? It may be that your car doesn't display any of the signs for poor wheel alignment, yet it's important to remember the measures we can take to prevent any future tracking issues. So what causes wheel alignment to change? Hitting a kerb - sounds obvious, but try to avoid ?kerbing it? as it can easily knock your wheel alignment out of place. Driving over a pothole - not always avoidable, especially during the winter months, but potholes can cause damage to the tyre as well as to the tracking of the wheel. Excessive wear to steering or suspension components - sudden jarring while driving can cause parts to wear and tear, such as suspension springs. If you suspect problems with your wheel alignment, you can get help fast - book a free wheel alignment check with Formula One Autocentres today. Search for your nearest local centre and get booked in today.